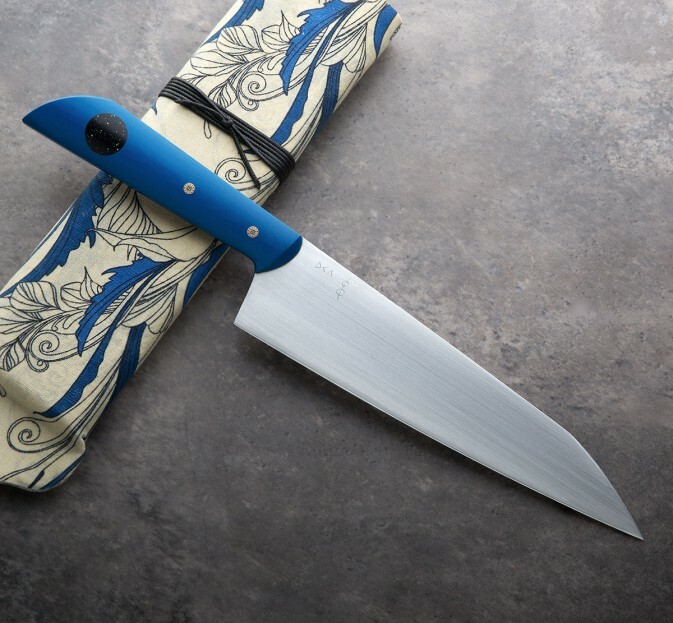 With a bold handle in the exceedingly rare Westinghouse Blue Ivorite Paper Micarta with a Corian 'Deep-Space' inlay and two mosaic pins, the gorgeous, hand-rubbed satin 52100 carbon steel blade is almost overlooked. But of course, it is not. 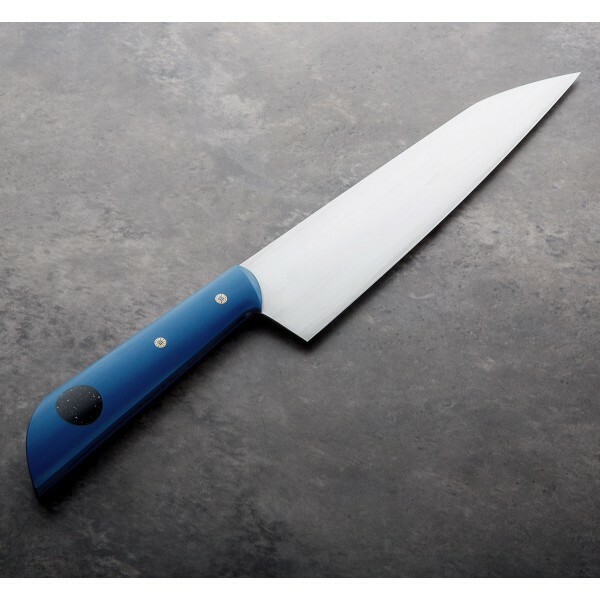 With Don's usual precision convex geometry in an XL version of his popular Personal Chef model, the 205mm blade has enough curve to rock nicely on the board, and enough weight at 8oz / 226g, along with outstanding balance, to make all-day prep work easy and effortless. A cloth-covered protective case is included. 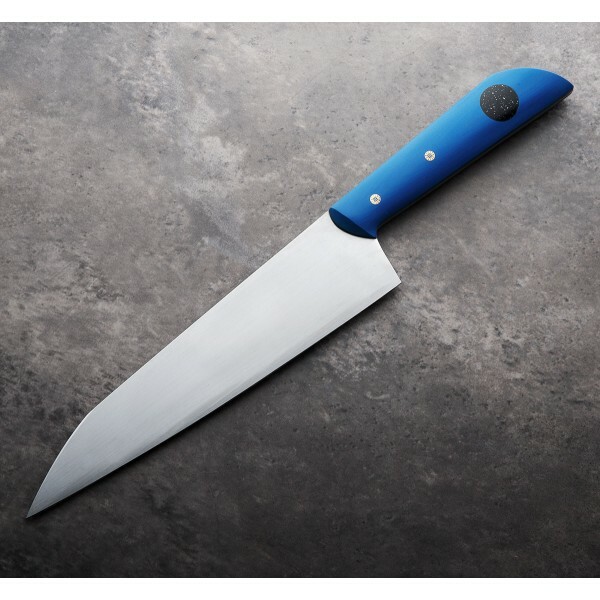 The XL version of Don Carlos Andrade's Personal Chef Knife model with full-tang construction is poised to be your go-to kitchen blade no matter how many guests you're cooking for. 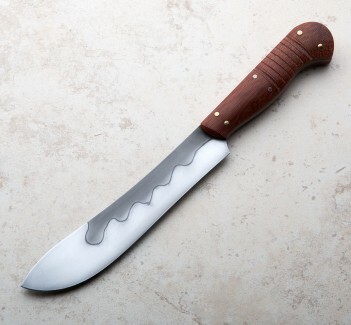 Handmade at his shop in Los Osos, California, Don's heirloom-quality, purpose-built custom cutlery is designed and built with inspiration not only from a decade as a chef himself, but from nearly two decades of bronze and stone sculpting, followed by teaching, bladesmithing and forging. 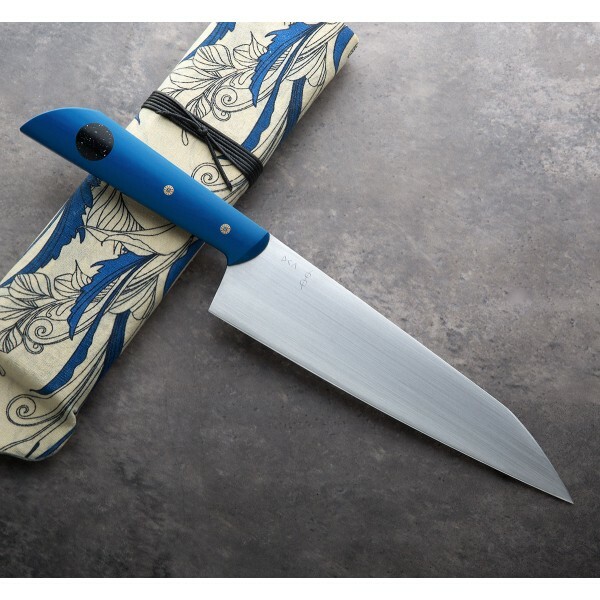 This XL Personal Chef represents the quintessential chef knife for the modern cook.  Blade length: 205mm / 8" . Overall length: 13.25". Blade width at heel: 3.2mm. Blade width 1" from the tip: 1.6mm. Blade height at heel: 49mm. Weight: 8oz / 226g. Blade: 52100 carbon steel with satin finish. 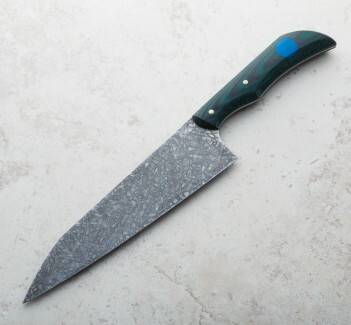 Handle: Rare Blue Ivorite Paper Micarta with with Corian 'Deep-Space' inlay and mosaic pins.